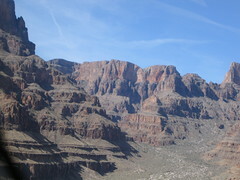 HTe last thing I did before leaving Vegas was go on a helicopter trip to the Grand Canyon. YOu have to do this – a brilliant few hours. I’d advising booking on the internet as opposed to through the hotel as my trip was $100 less than many of the others on the trip who had booked through their concierge. Seven of us, plus pilot were loaded up in to small helicopter and flew out with lots of commentary to the Canyon, where we landed and wondered around for about 25 minutes before being transported back. Make sure you’re not scared of flying, or heights, and take lots of pictures.